The X Minus 2 Card Printer is the easy way to find and print customs cards right from a website, up to 3 per page, with no downloads or graphics editing required. Currently only C3G, C3V, and SoV cards are supported, but we're going to add cards from other individuals and customs groups too! (If you want your customs added, PM me for details). Requirements: Any of the 3 previous versions of the "big 4" browsers. At the time of writing that means you need at least Internet Explorer v9, Chrome v32, Firefox v26, or Safari v5. Chrome is strongly recommended if you have the choice. After loading the webpage, just click through the green categories listed on the left to see the available cards. 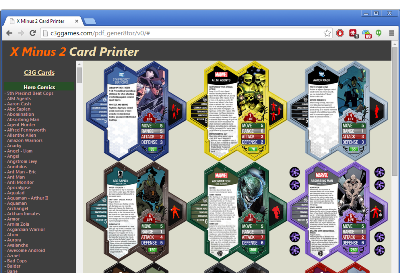 Click on the names of the cards you want added to your print job. The cards will show up in a grid in the main area on the right. If you want to remove that you've already added, just click on the picture of the card. When you have all that you want printed added, select whether you want two or three cards printed per page using the option below the list of cards. Three is the default if you skip this step. Some day I may create a built-in option to generate PDFs, but for now you have to tell your browser to do it for you. If you're using a Mac, open up the printing screen. In the lower left corner you can select the option to save it as a PDF instead of printing. If you're using Windows, the solution will depend on what browser you're using. If using Chrome, hit the change destinate button on the print screen and select "Save as PDF." If using Firefox or Internet Explorer, you will need to use a PDF print driver. If you don't already have one, try PrimoPDF. Download and install it. Then when you want to create a PDF, hit print in Firefox/Internet Explorer and select "PrimoPDF" as the printer. Anything sent to this fake printer will be saved as a PDF instead of printed. Make sure whoever prints the PDF for you prints it using the "Actual Size" (not "Fit") setting in Adobe Reader. If you're using Internet Explorer, do a print preview before printing and set the print size to 100% (i.e., turn off "shrink to fit" on print preview page). Turn of headers and footers to avoid it overlapping the cards. If you're using Firefox (with Windows), turn off "shrink to fit" (i.e., set scaling to 100%) in the print preview box. You also must turn off headers and footers. I don't think this ever happens using Chrome or if you're using a Mac with any of the supported browsers. If that understanding is incorrect, please let me know. If printing from a generated PDF, be sure to have Adobe Reader print it at "Actual Size" (not "Fit"). If you are not in the United States (and using A4 size paper), you must use the print 2 cards per page option. Printing 3 per A4 page is not supported, but something I can look into if there are requests and someone thinks they have a printer that can print with only a few mm of margin on the left and right sides. It can fit, just barely. First, turn off "shrink to fit" (i.e., set scaling to 100%) in the print preview box. Also turn off headers and footers in the print setup box. Check to see if that helped by doing another print preview. If it did, great. If not, you've encountered a bug that is in current versions of Firefox when printing to most printers. Printing 2 cards per page will work fine. If Firefox has this bug with your printer and you really want to get 3 cards per page, print to a PDF file instead of your printer (see above). The PDF printer does not have this bug. You can then print the PDF file as normal. Some cards (e.g., C3G's Absorbing Man) have markers included with the card. 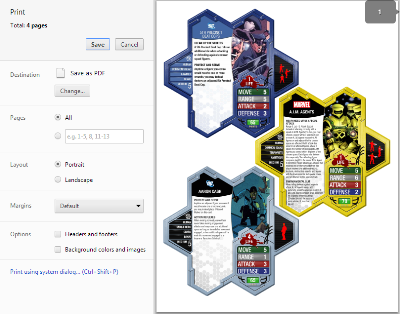 When printing 3 cards per page these markers can sometimes overlap with the neighboring card. I do not have an automatic fix for this problem, and it will probably be quite a while before I implement one. If the card only has markers in a couple of corners you may be able to change the order of printing the cards to avoid the overlap. If there are markers on all four corners, that's not possible so your only options are to either print 2 cards per page or insert a "blank card" (found in the Miscellaneous category) as the middle card on a page with one of these troublesome cards. That has the effect of limiting you to two cards on that page with the other pages still able print 3 per page. It's a password that members of customs groups use to unlock/load their pre-release cards into this web app so they can print them. Without a code, you can only see the publicly released cards. Just did a trial run. Print Preview initially showed the cards were too big, with it spanning multiple pages for just the 3 cards. All I did was click 'fit to page' and then it shrank down to one page and was ready to go. I'm using Firefox on a Windows system. Thanks a lot for this Xorlof!! I'm way behind in my card printing and this will save me a ton of time and money once I get caught up. Not that you need the rep but I'm sending some your way anyway. ...you will see everything should be sized exactly right, (well, within 2/100th of an inch or so anyway). Selecting 'fit to page' by itself will result in cards being a bit undersized. Only step #2 is required for Internet Explorer, but you can also do step #1 if you don't want to see the headers on the printout. NONE of that is required in Chrome. It gives web developers the control to make everything needed happen automatically. Last edited by Xorlof; April 27th, 2014 at 03:36 PM. And a suggestion : make some filters (per wave & per name at least). Our prayers have been answered! Thanks, C3G! Now, who do I rep for this?!? Though numerous pronunciation attempts have been made, I have recently spurned my moniker. Feel free to refer to me as Waldorf or Sippin'onSki. Last edited by cwidje; April 27th, 2014 at 04:53 PM. BTW I just had a thought that the next project might assist here with the wave grouping. All rep goes to Xorlof on this one! And he deserves a ton! (Though A3n helped with a lot of the technical stuff too, so rep that guy as well!). I think I might finally have a good reason to switch over to Chrome! There's been a massive security breach on IE, so you want to switch to Chrome/Firefox/Safari/Opera ASAP. Also, Xorlof, what does the title mean, anyway?